How do I update my Pinterest username in Tailwind? 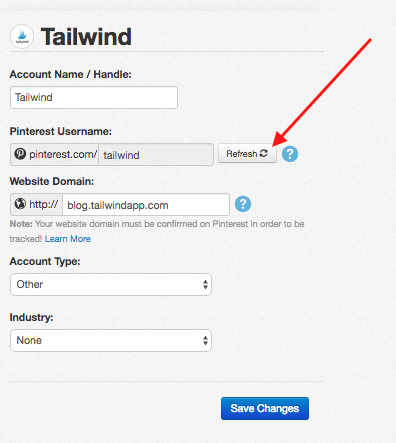 Here's how to refresh your Pinterest Username in Tailwind. Uh-oh, have a case of Mistaken Pinterest Identity? Not to worry, we can fix that! If you've just changed your username on Pinterest, and you’re not seeing your new username yet in Tailwind, don’t worry! It will automatically be updated within 24 hours. If you don’t feel like waiting any longer, here’s how you can refresh it yourself right now. 2. Click the Refresh button next to your username to update your Pinterest username immediately. Note: You don’t need to click on the “Save Changes” button - the username refresh saves automatically for you!